Taking a bold approach to enhancing the level of support provided by UHealth’s Information Technology team has paved the way for an expansion of IT’s efforts into perioperative optimization across eight areas at the health system’s flagship hospital, UHealth Tower. 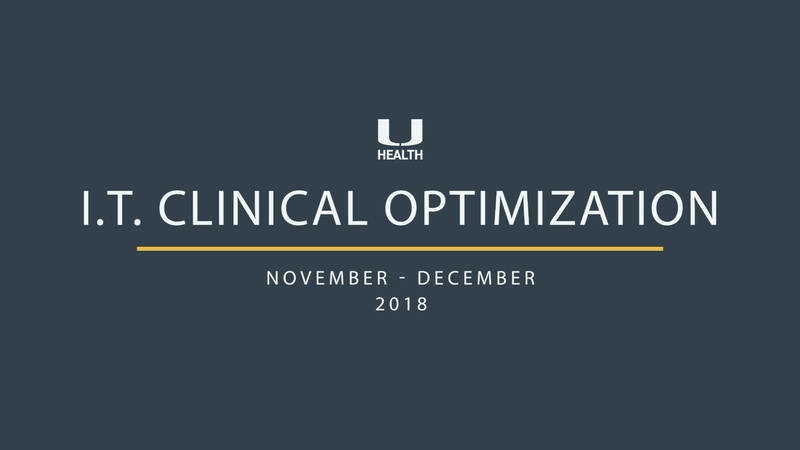 This optimization initiative, which ran from November to December 2018, was a tremendous undertaking for the UHealth IT department in an attempt to deliver solutions which improve both the experience we offer to our end users and our systems. We successfully bridged the people, process, and technology workflows with this pilot as we optimized technology, standardized IT workflows, and increased OR efficiencies. With 27 members of the UHealth IT team working on this project, we addressed over 230 areas of optimization in a short 6 weeks. Updates included a combination of enhancements and break fixes impacting a wide range of user groups in the UTower’s Main OR, Ambulatory OR, Departmental Surgical Scheduling, Insurance Verification, Registration, Revenue Integrity, Charge Poster, and UPAC. Impacted groups included surgeons, anesthesiologists, residents, schedulers, and nursing staff. To access resources and re-education materials, visit uchart.it.miami.edu/periop. Following the success of the Perioperative Optimization, the UHealth IT Optimization team will strategically move into additional operational areas across the health system, starting with the Cath Lab and Heart Station in January 2019. In line with the strategic objectives defined through the 5 to Thrive initiatives, UHealth Information Technology (UHealth IT) is preparing for the double upgrade of UChart, the health system’s electronic health record (EHR), on Sunday, September 30. Once complete, UHealth will be the first health system in South Florida to be on the latest version of UChart. The new system features will play a key role in providing our healthcare workers with the tools needed to achieve a standard of excellence that will make UHealth a preeminent health system for the 21st century. With the enterprise-wide implementation of UChart and the latest system upgrade behind us, the continued partnership between health care providers and the UHealth IT team will be critical to delivering better, safer and more efficient care to all. With less than 100 days until the Sunday, September 30 upgrade to UChart v2018, we are excited about the new features and enhanced functionalities which will have a tremendous impact on how we continue to serve our patients. Highlighted below are some of these enhancements impacting all facilities across the UHealth System. We are pleased to announce UChart will be upgraded from v2015 to v2018 on Sunday, September 30. While this is a tremendous undertaking affecting all clinical users across our hospital and clinics, the upgrade to UChart v2018 is a double upgrade encompassing significant changes with enhanced functionalities and new features needed to provide the transformative healthcare, exceptional medical education, and superb patient experience to those we serve. Over the coming months, we will share additional information, including invitations to participate in user acceptance testing, access to the updated playground environment, tailored demos, and computer-based training resources. University of Miami Hospital (UMH) is significantly transforming its patient care experience by upgrading its electronic medical record (EMR) system to UChart. This will mark the final phase of the University’s creation of a true enterprise-level EMR, and implementation is on schedule to be completed in October 2017. A significant shift for healthcare providers at UMH will be the transition from Meditech and paper documentation to fully electronic medical records. To ensure this transition has minimal inconvenience to current workflows, the UHealth Information Technology (IT) implementation team is leveraging best practices from previous implementations at Bascom Palmer Eye Institute and Sylvester Comprehensive Cancer Center. Additionally, the UHealth IT training team has developed role-based training tracks for nurses, physicians, and staff at UMH. This streamlined approach was developed to minimize impact on day-to-day operations and will offer all healthcare providers the knowledge, tools, and access needed to effectively use UChart. Effective Sunday, August 27, all UChart users accessing the system through a non-shared workstation, e.g. a private computer, or through a remote connection, will be required to authenticate via Duo Multi-Factor Authentication (MFA) once per 24-hr period. This provides additional security to keep your UChart account and our patient data secure. If you have not enrolled in Duo MFA, you will be redirected to the registration site. Please complete the enrollment process as soon as possible to avoid further delays. Note: When using the following workstations types, the UChart desktop icon must be used to access the system. This will enable you to log in as normal. If you have any questions about Duo MFA, or need additional information, please visit www.miami.edu/multifactor, or contact the UMIT Service Desk at: (305) 284-6565 or itsupportcenter@miami.edu.